Construction on the Cat Linh-Ha Dong metro project has failed to keep to schedule. Work started on the Cat Linh-Ha Dong metro on October 10, 2011. It was scheduled to be open to passengers in 2016 but has suffered continual delays. The project was then slated for a test run in October 2017 and this was successfully completed last August. Minister of Transport Nguyen Van The asked for the prompt operation of the route in December last year as most of the work was finished. 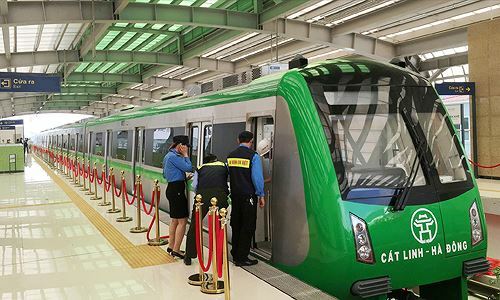 “In case, the project will fail to reach the operational schedule again, the Ministry of Transport will consider the responsibility of the project investor,” the minister noted at a recent meeting about the project with Hanoi authorities. However, to date, no official start of public operations has been announced. Ha Dong and Phung Khoang stations still lack the necessary equipment. A representative from the project contractor said that part of the project has not yet been completed, so it is impossible to operate the route on time as planned. The Cat Linh-Ha Dong metro route cost USD868 million funded by official development assistance loans from China. China Railway Sixth Group Co, Ltd is the project EPC. The 13-kilometre line has 12 stations and one depot area. It will have 12 trains, including 48 carriages. Each train with four carriages can carry 1,200 passengers.